Awards will be given for the best costume! The KCDS school with the most participants wins the coveted participation trophy. T-shirts are guaranteed for all pre-registered participants. 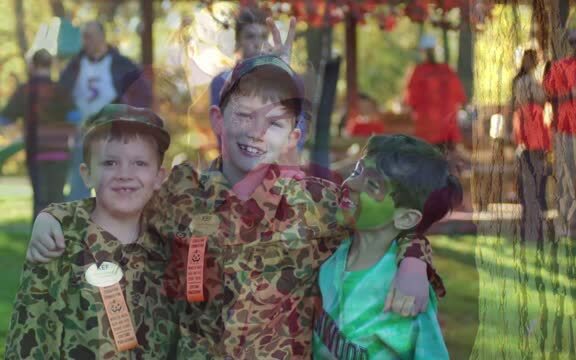 Don't miss out on this local tradition as we scare up a lot of fun at the park! Thank you for supporting the 9th annual KEF Monster Mash! The results are in: Congratulations to all the participants and award winners. Check out the photos: Thanks to Heather Schaen of Schaen Photography for donating her talent to capture these great photos. School Participation Award Sponsor - Sinton Air Conditioning & Heating, Inc.
AND Ben Green of Greensleeves Music for keeping us moving all morning! And also a huge thanks to our team of incredible volunteers who really make it happen, especially KEF board members, KHS Cross Country, National Honor Society & WIN Students. We look forward to seeing you next year Sunday, October 28, 2018! This 5k run event will give runners a cross country challenge around little 'ol Anson B. Nixon Park. Get ready to run on the paths, across the fields, dodging the frisbee golfers, over the streams and through the woods to the party at the finish line. Take in the beautiful autumn scenery as you navigate the 5k course. This fun-raising 3.1 mile fund walk will get you prepared to cover the neighborhood miles on Halloween night! This walk will follow the same course as the 5K Dash, but will be untimed. The 9th edition of this super fun kids Halloween tradition needs no adjustment. Kids can debut their costumes on this easy course circling the pavilions to finish back at the stage. There'll be no tricks along this course, just goodies along the way, so make sure they sprint with a sack! We did the mash, and it's a graveyard smash! In 2016, we had over 300 participants running through the stunning fall foliage of Anson B. Nixon Park. The event was sponsored by Cari Orthodontics and was a huge success! Bancroft Elementary School won the School Participation Award for the 4th year in a row and everyone looked awesome in their costumes.